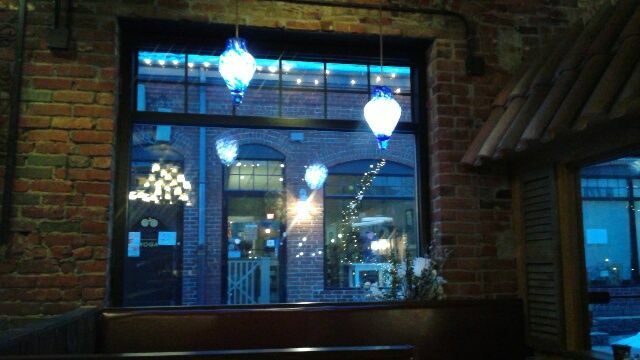 We're partial to neighborhood places where you walk to meals you write home about and Sophia's Grotto is one. When you're in Roslindale you might bring someone along who's been here before. Your GPS lady will be confused as mine, who is fertummelt, with all due respect to Siri. 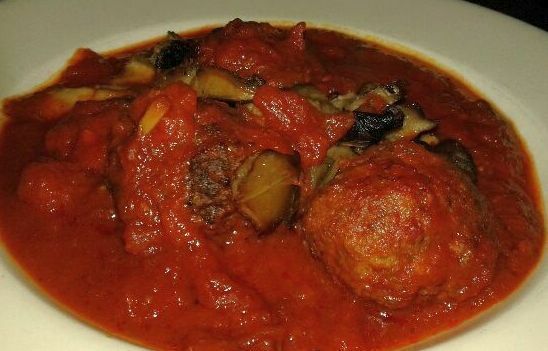 Sophia's is Italian, a cozy setting on a snowy night that calls for meat balls and spaghetti. It's spring, we blow in with boots and hat, and we say, enough. Enough already. It's time for outside but who goes for chianti with a snow chaser? 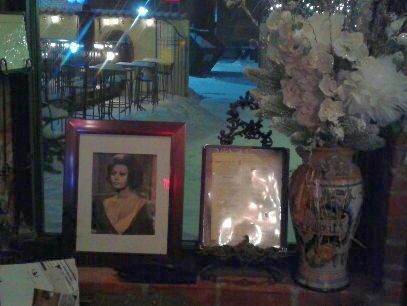 Right where you come in there's a tribute to Sophia Loren, what else. Sadly, she's not at the bar nor over the stove. We know. Grotto points to a patio with umbrellas, heat lamps, overflowing potted plants done up by someone who knows what they're doing, a pink flowered trellis, and trees that even in snow wear a promise of summer and gin in a halo of pink lights. Inside it's brick with high ceilings that looks to be a loft easily from the previous century if not the one before. Tiny pink sparklers are everywhere. You may need to know someone or come early for the seven-seat bar. Snug booths = romance; 40 seats are all taken on this night when to drive means taking life lightly. What else but calamari fritto: we have it any and everywhere. It's great with drinks, or a fine appetizer and when it's right, it's what's for dinner. It's what's for dinner. 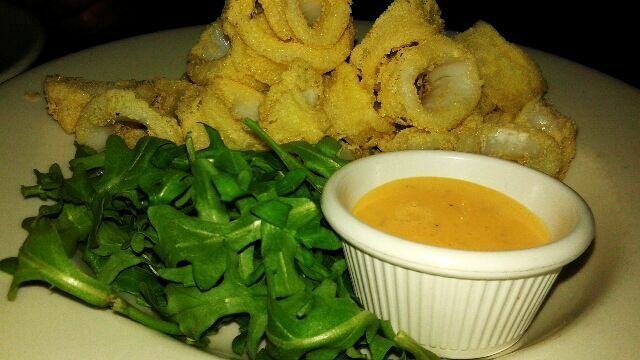 Sophia's calamari is hot with a light coating. There's arugula salad and citrus aioli with heat to start a fire. Good thing Mo says go easy. It's a cool dish, all right. No peanuts, no sauce, no garlic, no peppers and for this we are grateful. It's just fish. Where's my beer? And what I wait for, if you got no oysters, are Sophia's meatballs, a mix of veal, sirloin and pork with mushrooms and red sauce. Yours can have onions and cheese, which we put on hold. You know meatballs, I know meatballs. These are generous, rich with saucey mushrooms that would be so good with pasta - if only. From tangy plum tomatoes, I get how Sophia's earns Best of Boston awards from Boston magazine. Just last fall they earned a Boston's best for Roslindale from the Improper Bostonian magazine. Of course. 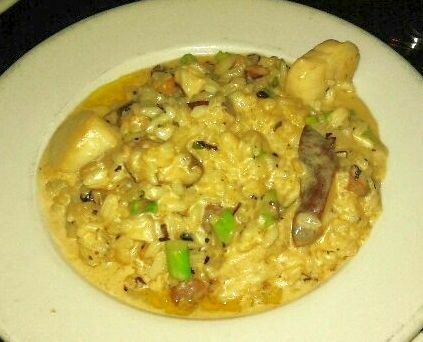 Finally, Mo's scallops and risotto, a mellow mix with mushrooms and asparagus with seared scallops. Making scallops? It's not easy to get them out in time but they did and they are. Mo's polite so there are leftovers. The next day risotto's still creamy with bright asparagus undismayed by a night at the refrigerator. Who doesn't want lunch of what we didn't finish last night? And meatballs, some left to travel. That's a lunch. Everything we order are small plates and under . You look for artichoke hearts with goat cheese and prosciutto, or stuffed eggplant with ricotta and parmesan. And there are sandwiches: mushroom, or meatballs or parma or stromboli, with sausage, peppers and onions. Pizzas dressed with chicken, with prosciutto, with four cheeses, with three mushrooms and two cheeses, all under . Entrées feature mussels, pesto, gnocchi, ravioli,and cannelloni. There's salmon, chicken, pork, tournedos, sirloin and paella plus fish stew under . Kids are welcome: it's ziti with cheese or red sauce, and grilled cheese. Tonight's kids eat. An apt setting: Spanish and Italian music, efficient service, and a Tuscan wall with shutters Diane Lane sat by in Under the Tuscan Sun. Kind of romantic, right? We sit for 2 1/2 hours nursing drink and Italian bread we make the most of with its bean and hummus spread. Though we did not, do dessert: cannolis, tiramisu, chocolate mousse cake and New York cheesecake. Out this window is a wrap-around patio that could be another 50 seats. Not today, but soon. We can't wait. You shouldn't either. Even if it means a drive. Park on the street and walk through the alley. You'll find it. We have no reservations but you will, especially weekends. Call after 4 for dinner; weekend lunch starts at noon.